our products and generously allowed us to share them with others! I am a loyal and happy customer, not just because of the quality and magic of your products but because of the risks you took and the extra hard work you put in to create healthy healing products for all of us. It's one thing to cook up a bar of soap in the kitchen for a summer adventure, quite another to do it day in and day out. Your tireless efforts, wonderful products, lovely farm and shop are a delight and blessing to me, and others, for which I am truly grateful. "Ma famille s'est rendue à l'Île-du-Prince-Édouard il y a quelques années de cela et nous avons parcouru l'île d'un bout à l'autre en bicyclette. Nous nous sommes arrêtés chez vous et avons achetés quelques savons et avons vus vos chèvres. Depuis, chaque année, mon mari m'achète de vos savons pour mon anniversaire de naissance... 12 savons: un pour chaque mois de l'année! Lorsque je me sers de votre savon, cela me rappelle l'Île-du-Prince-Édouard et les meilleurs vacances que j'aie jamais eues. Merci pour ces bons souvenirs!" Definitely a five star. Shipment comes in good time, and there is always a free product included. Every soap I have tried has worked amazing on dry skin. <y husband who has severe dry skin, has finally found a product that keeps it under control. The soap and the moisturizing stick work extremely well together. The best part of all is that these products are made with natural products. Highly recommend. "Venant de l'Alberta, j'avais des démangeaisons cutanées difficiles à soulager. J'ai essayé tous les savons et les lotions imaginables, sans succès. En touristes à l'Î.-P.-É. il y a quelques années de cela, nous nous sommes attardés à votre magasin au détail pour y acheter du savon. Depuis, je n'utilise que vos produits. Mes démangeaisons ont disparues! Je vous remercie de tout coeur pour vos merveilleux produits." shower without fear :) Looking forward to ordering more sooon! p.s. say, "hi" to the goats! Edward Distiller. In all the past years, she would brag about your soaps. to try anything to save him from the issues I had faced. difference in his acne breakout.....your Super Soap is Awesome! and my acne has gone away!!! I so wish I knew about you back in the 80's!!!! buy from you.....you have an AWESOME product! Keep up the great work and look forward to visiting you again soon! To all the fabulous people at Great Canadian Soap! face for about a year and a half now. wash my hair every morning, but my scalp and hair look freshly washed, even 12 hours later!! I am so impressed. I will NEVER use commercial shampoo again. I was on vacation this summer (Aug 2013) visiting Nova Scotia and PEI. Canadian Soap Co. I just had to turn around and come in to visit. at Christmas and let them try some of your product too. hand cream. Wowzah wow wow ! Love it Love it LOVE IT! Alleluia!! Finally, something that works great and smells so delightful! Did I say it was AWESOME yet?? It's AWESOME!!! tell everyone. I know and will buy more of your products for sure!! One of the best birthday present ever! Keep up the great recipe! It's Fabulous!!! say that I learned quite a bit from your presentation...thanks for that. soft, no longer the dried out menopausal prune. We stopped in last week while on vacation from Nova Scotia, and it was a great experience. We are loving the soap, achey joint oil and cream we bought. The kids loved feeding the goats and bottle feeding the kids! Here are a few pictures. I'm so happy I stumbled across your website! I am really looking forward to trying your products! I have such a difficult time finding natural products that are healthy (our skin is like a sponge and it absorbs everything) and I try to be careful what I put on my skin! Thank you! I just love your products! I have been shopping at your lovely establishment since you had the little stand by the road!! It's been a 'must' stop for my girls and I when we visit the Island. Thanks so much for your friendly, professional care for each and every need we have. I have 2 daughters with eczema, and your products keep their skin healthy and rash-free! Happy children result in happy parents :) Thanks again! We were in Brackley at Blue Waters Cottages from July 6-10/10 and we stopped into the shop again this year. We discovered your shop a couple of years ago and now it is a highlight stop on our vacation. We really love the shop and stocked up for the year for family members and some for ourselves. We like it as it feels great, smells great and is something to take home that you actually use and enjoy. Wish we didn’t have to wait until next year to visit again. Great job. Just to let you know I received my prize package today. Thank you so much, it contained 2 of my favourite products, shea butter cream and lip balm, I look forward to visiting your store in August when I will be visiting PEI. Hi, Just wanted to let you know that we continue to enjoy all of your products that we have ordered. Being totally spoiled now, we only use your soaps. Both of us have our favourite scents. I do have a couple of comments though, I would love to see a larger container of the goat’s milk cream (3 times the current size would be much appreciated); this is totally amazing!! I really like the shea lotion but find that it is very difficult to get out of the tube. Any suggestions would be greatly appreciated or perhaps a different container would resolve the issue. We're aware of the issues with the Shea Butter Lotion and we're working on the best solution. Thanks to you for making it. Thanks to her for getting me what I asked for! Kimberly in Saskatchewan sent us a lovely email that encourages us in our mission to help people live more comfortably and healthfully in their skins. Thanks, Kimberly! I have purchased the wonderful soap that you make, both in person and online! We love the unscented bars in the shower and to use on our newborn daughter! She is now almost 1 year and has never had any skin issues what-so-ever! I'm a pharmacist by profession but I truly believe that personal care products contain so many toxins that they are worthwhile replacing with hand-made natural products. I do have an inquiry regarding the liquid soap. 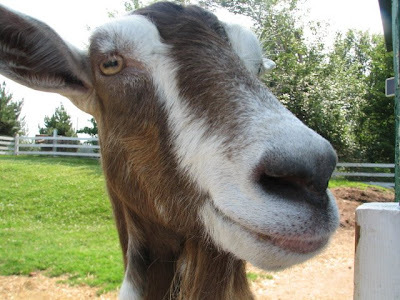 Would you be able to make the goat's milk liquid soap in an unscented version? If so I would like to place an order for soap, lip balm, and liquid soap. Please let me know at your earliest convenience! Here's a great scoop for all of you out there who have dogs. I ran out of dog shampoo so I washed the pit bull with some unscented goat soap and for a dog with sensitive skin, this stuff is GREAT. He is the equivalent of a redhead and is often prone to itchy, dry skin. Not now. He's shiny and silky and itch free and he smells much better too. No problem. Print away! Your soap worked so well for Gator and there are tons of dogs out there with sensitive skin who should be using your soaps. People should know this. Perhaps you should start a line of products for the stinky, four legged, family members. in the future. I'm hoping to win that fantastic prize in November! I'm just writing a quick letter to say that I enjoy your products very much. I was recently in PEI and stopped in at your store. I purchased some soaps and some shea butter lotion. I am very glad that I did so because your products are phenomenal. Order Comments: absolutely love the soap!keep up the great job you're doing! hope everyone there is well and having a great fall. love the soap we bought when we were in PEI this summer .. The highlight of my visit to the Island was visiting the Great Canadian Soap Co. where I purchased MANY bars of soap made from goats milk. I learned that only a small percentage of "soap" on the market is truly soap, and that most is detergent made from harsh chemicals. My husband and I have been using this soap exclusively since getting back (and while we were on the road). I am sold on its quality, and I will be passing on my unopened bars of "soap" (from the grocery store) to anyone who is not interested in a quality product. For years we have been purchasing anti-dandruff shampoo for hubby, and he still had problems with itchy and flaky scalp. He now uses the goats milk soap and has had no further problem with dandruff. The dry skin has disappeared from the back of my arms. I am very impressed! I will be posting a link to the site by the weekend. My wife & I stopped at your store/factory today quite by accident. We are camping in Cavendish and on a rainy day were out for a drive. We stopped to see what soap made out of goat's milk was all about. What we ended up with was the most enjoyable experience we have had on this trip and probably the highlight of our trip. The reasons - 3 of them, the 3 young girls who waited on us. No rush, as much info as we needed/wanted and very pleasant. Having worked with the public for well over 30 yrs, I know the client service is an extremely important part of business. It is also the best and cheapest form of advertising a company can have. The client service we received today was second to none. You should be very proud of these young ladies. We ended up spending quite a bit more than we had planned, but it wasn't due to any pressure sales, it was because we recognized a quality product and took the opportunity to buy while we were there. We were also taken to the barn and "introduced" to the baby goats. So from a couple from southwestern NB on vacation, I can tell you that these 3 ladies have made our trip a much more enjoyable experience. As for the product, I am sure it is all that you have advertised it to be and we will be customers again. - they all love them! Glad you have an online store, as we will be ordering more soon. Thanks again for the information and great visit. Ginny from Georgia, USA, sent this picture of Dianna. What a great picture! It shows Dianna’s true personality. Thank you Ginny for sharing your comments and pictures. Thank you for your email. I forwarded it to my daughter so she'd be able to save it in her address book as well. We had such a memorable & fun time while we were there. My 7 year old granddaughter laughed continuously with the goats. Not only did we enjoy our visit with you, but I can already tell a difference in my skin! I'm a skin cancer survivor and my skin stays very dry and patchy. But, in just the week that I've been using your products, I actually look normal again. I can't wait to see what my dermatologist thinks. I also agree that it would be a great idea to put up a map to record where all your guests visit from. We're from Georgia, USA, at Lake Oconee, an hour & half east of Atlanta. My daughter lives in Macon, south of Atlanta. Anyway, thanks again for the fond memories & great gifts! Could you please tell me your hours for the fall? My daughter will be going to PEI on Oct. 25th and I'd like her to stop in and get me some of your soap/shampoo. Big question: What would you recommend (shampoo wise) for psoriases on the scalp. I am just now (a little slow in my old age --teehee) discovering the harmful effects of SLS (Sodium Laureth Sulphate) on the skin. It is very difficult to find any shampoo that does not have it. So this morning I looked at the bottle of soap I bought at your place this past summer, "Revitalizing" Liquid Goat's milk hand and body soap, and it is SLS free. YEAH!!! So I used it to shampoo my hair. Now I want to try the real deal - shampoo! The shampoos we make are a Goat's Milk Shampoo Bar and Goat's Milk Liquid Soap that can be used on your hair. The Shampoo Bar scents are rosemary and lavender, geranium and lavender and tea tree and peppermint. The geranium and lavender would be the best for your psoriases. Personally, I like the hard bars to shampoo my hair. It takes a few extra seconds to lather but it lasts longer then the liquid soap. It also feels old fashioned! If you would perfer a liquid, check our webstore at Goat's Milk Liquid Soap and Shampoo for the different scents. Well we have returned from our holiday to the Maritimes and have to tell you that visiting your soapshop was tops for us.. It brought back memories of my childhood when I would return home from our country school (a walk of one and three quarter miles--uphill both ways-WELL, not quite but there was a hill!!) and find on the old buffet a new batch of homemade soap cut into rough pieces ready to cure. Nothing special, just homemade, homestead soap but lovingly made by my mother. We appreciated the time that you took to explain about commercial products and to show us the ingredients that you use to make your very special soaps. We have four grown children and for Selena our oldest we were having trouble completing her assortment of gifts so my wife added the piece of milled Lemongrass soap to her bag. Selena was "very thrilled" with this and continued to smell it and pass it around for everyone to enjoy. 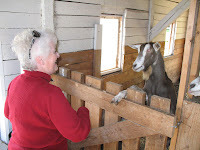 It was very nice to talk to you and we really enjoyed our visit with the Goats as we left. We had milk goats on the farm when I was a kid so that brought back a few memories as well. Our one Nanny, a white Saanen, would get up on the milking stand and call to us when she wanted to be milked. We moved off the farm a few years ago(we used to live on an acreage and had a honey farm) but we miss the farm and may move to an acreage sometime if the opportunity presents itself. I was interested to hear that you are home schooling your children which I think is wonderful and would have liked to hear a bit more about that but it was late in the day. Of all of the maritimes we really liked P.E.I. especially since there are so many crafatmen/artisans to visit . I have to tell you that our visit to your soapshop was,unique and interesting and definately a highlight and we are really glad we stopped. Keep up the good work!! We hope to visit you again sometime. Thank you for your e-blast. We thoroughly enjoyed our many visits to the Great Canadian Soap Co the times that we stayed at a relative’s Brackley Beach cottage. 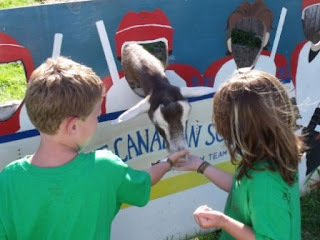 It was so close and the entertainment value for the kids visiting your sweet little goats was fantastic. Is Buttercup still roaming around? She was so adorable. We still have a good supply of your soap in the cupboard from our visit 2 years ago. I believe it’s the Magnolia scent that my 14 year old is presently using. She swears by it for keeping her face blemish free. Thank you very much for your contact info and email newsletter. 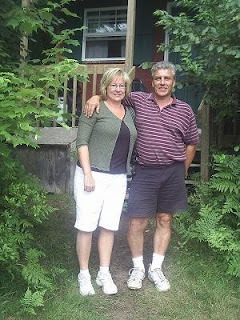 We had a wonderful holiday in PEI and hope to return in a couple of years. Meanwhile, we will certainly take advantage of your on-line store, now that we know the website. Our daughter and son are coming home for Xmas in a couple of days, and Nikki will receive the gift-pak we bought when we were in your store. We are currently using your bars and both us and some friends that we gave gifts to love them! Thanks again. ... Travelling through P.E.I. this past September and bought your soaps, loved them!! I ran out and tried some of the local ones in Ottawa but they do not compare. I'll wait to hear from you before I place my order. the mosquitoes do not bother her. My family used your soap for the first time last year on our trip to PEI. We bought a few bars and then I purchased some more online. I can't wait to til our next trip in June so I can stock up on our favorite scent....Water Lily. Please don't ever stop making it! It is so lovely to hear our soap continues to help people with sensitive skin. Handmade soap is great for your skin but when you add goat's milk it superfats the soap. Superfatting equals moisturizing.